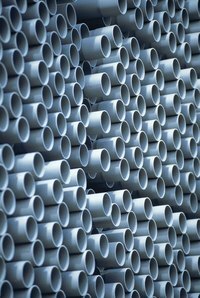 A clean out is a PVC pipe attached to a sewer line. It is generally located outside a building or home. Sewer lines are buried in the ground making them difficult to access. A clean out provides access to the sewer line in case of a backup or clog. It is attached to the line with a T joint. A clean out is a pipe that runs vertical to the surface of the ground. Due to its location, a clean out — and the plug used to cap it — often incurs damage. Fortunately, clean out and plug repair is simple. Locate the crack or break on the clean out pipe or cap. If the cap is the only portion broken, simply unscrew the plug from the top of the clean out and replace it with a new one. If the crack or break in the clean out is below the surface of the ground, dig down with a shovel until the crack or break is completely exposed. Cut the clean out pipe 2 inches below the break with the pipe saw. The section of pipe you cut off includes the plug and the threaded coupling used to attach it. Cut the damaged portion of the pipe off this section, 2 inches above the crack. Dispose of the broken portion. Bevel the end of the clean out cut — the section still in the ground — with a grinder. Do the same to the PVC pipe coupled to the fitting and plug. To bevel, grind around the outside of the pipe wall, 1/16 of an inch deep. The bevels are simply to ease the fit of the coupling to the two pipes. Primer the end of the clean out in the ground with a swab. Do the same to the inside wall of one end of the coupling. Coat the primer on the pipe and inside of the coupling with glue. Slide the coupling over the end of the pipe; twisting the coupling. Hold the coupling in place for 10 seconds, otherwise the chemical reaction between the primer and glue might force the coupling to back off the end of the pipe. Prime the threaded pipe attached to the coupling and plug. Also prime the inside wall of the coupling attached to the clean out that is in the ground. Glue them and slide the pipe into the coupling. Hold it in place for 10 seconds.